Skownan – Cree and Ojibway name meaning “to turn around the point or turning point”, originally the name of the Indian reserve. 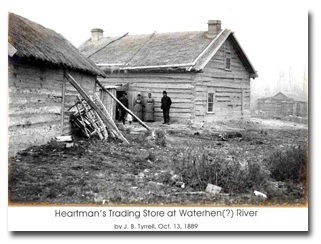 At the Treaty 2 signing, the name Waterhen or Waterhen River band was used by the Commissioner – perhaps geographic names were easier to distinguish and pronounce rather then Cree or Ojibway names. Treaty No. 2 – The Treaty referred to as No. 2, was signed on August 21, 1871 between Her Majesty’s Commissioner, Wemyss M. Simpson, and “the Ojibway Tribe of Indians” inhabiting an area to the north and west of the just concluded Treaty No. 1. The purpose of the Treaty was “to open up to settlement and immigration” the land covered by the Treaty and to ensure there would be “peace and good will between them and Her Majesty. Chiefs and Headmen were named by the assembled Indians. These officials were authorized on their behalf to conduct the negotiations and to sign the Treaty. Chiefs and Headmen were to become responsible to Her Majesty for the faithful performance by their respective bands “of such obligations as shall be assumed by them”. 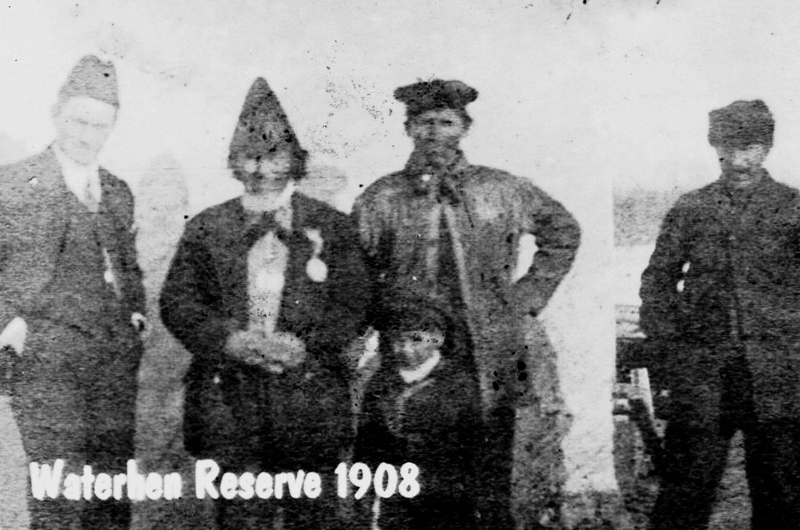 The Chiefs named were – “Sousonse”(Little Long Ears), for the Swan Creek and Lake Manitoba Indians. “Masahkeeyash”(He who Flies to the Bottom), and Richard Woodhouse, whose Indian name is “Keweetahquinnayash”(He who flies around the Feathers), for the Indians of Fairford and the neighboring localities. “Francois/Broken Fingers”, for the Indians of Waterhen River and Crane River and neighboring localities. ‘Mekis”(The Eagle) or Giroux, for the Indians of Riding Mountain and Dauphin Lake and remainder of the territory hereby ceded. Her Majesty’s representatives, the Commissioner and Lieutenant Governor Adams G. Archibald, who was also present, received and acknowledged the persons so presented as Chiefs and Headmen. 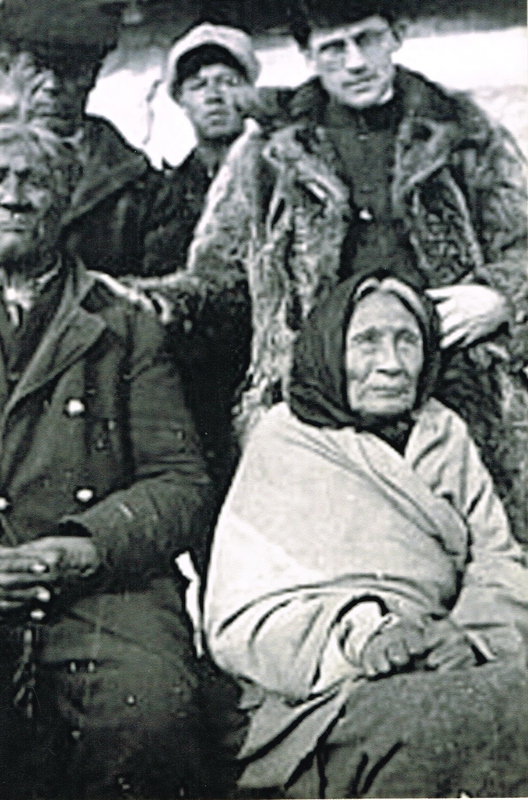 Her Majesty agreed and undertook to lay aside and reserve for the sole and exclusive use of the Indians. Chief Broken Fingers For the use of the band of Indians belonging to the bands of which Francois/Broken Fingers is Chief, so much land on the west side of the Waterhen River and the south side of a lake with the same name so much land as will make 160 acres for each family of five or in the same proportions for a greater or smaller number of persons. A present of $3 was given to each person belonging to the band here represented. Her Majesty agrees to maintain a school in each reserve hereby whenever the Indians of the reserve shall desire it. Her Majesty’s Commissioner shall, as soon as possible after the execution of this Treaty, cause to be taken an accurate census of all the Indians inhabiting the tract above described, distributing them in families, and shall in every year ensuing the date hereof, at some period during the month of August in each year..at or near their respective Reserves, pay to each Indian family of five persons the sum of $15., Canadian currency, or in like proportion for a larger or smaller family, such payment to be made in such articles as the Indians shall require of blankets, clothing, prints (assorted colours), twine or traps, at the current cash price in Montreal, or otherwise if Her Majesty shall deem the same desirable in the interest of Her Indian people, in cash. The Chiefs, on their own behalf and on behalf of their people, promised to strictly observe the Treaty, to conduct and behave themselves as good and loyal subjects of Her Majesty the Queen, to obey and abide by the law, to maintain peace and good order among themselves and with others. Persons of Ojibway/Cree and European ancestry had a choice, they could enter Treaty and be citizens of the self-governing First Nations with the special direct relationship with the Crown, or they could become Canadians and relate to the Crown through the Canadian governmental system. Strong and prosperous vision for our future generations.